In 1776, Thomas Paine unleashed the persuasive power of the written word as Common Sense, rallying Americans to declare independence against the mightiest empire in the world. This 80-page picture book biography follows the inspiring journey of courage, failure, and resilience that led a penniless immigrant to change the world with his words. As an English corset-maker’s son, Thomas Paine was expected to spend his life sewing women’s underwear. But as a teenager, Thomas dared to change his destiny, enduring years of struggle until a meeting with Benjamin Franklin brought Thomas to America in 1774…and into the American Revolution. Within 14 months, Thomas would unleash the persuasive power of the written word as Common Sense - a brash wake-up call that rallied the American people to declare independence against the mightiest empire in the world. This fascinating and extensively researched biography, full of primary sources, will immerse readers in Thomas Paine’s inspiring journey of courage, failure, and resilience that led a penniless immigrant to change the world with his words. Sarah Jane Marsh takes a page out of Thomas Paine’s book with her straightforward, engaging text, accompanied by bold and vibrant illustrations by Edwin Fotheringham that evoke the passion and charisma of this revolutionary figure. 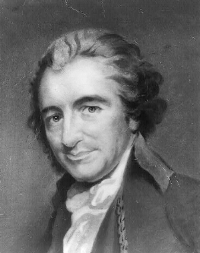 See what famous folks said at the time about Thomas Paine's shocking pamphlet Common Sense. Who was "charmed"? Who thought it was "so manly"? Sarah and Dr. Jett Conner discuss their books on Paine.